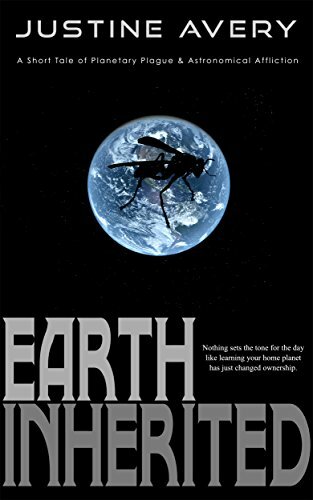 In “Earth Inherited” by Justine Avery, ShZ, an insectoid alien from the GrT colony, inherited the planet Earth from his mother who is the late Queen JjT. ShZ is very unhappy when he discovers that this planet is infested with foul smelling humans, who have almost destroyed his inheritance with their obnoxious habits. His own planet is having major problems, and his addiction to royal jelly has consumed almost all of the royal jelly resources there. This shortage has prevented the creation of new queens, so ShZ’s own race is in danger of dying off. Would-be queens are now workers instead of breeders because of him. ShZ is sadly disappointed when he goes to Earth to announce his new ownership. First of all, the humans are foul and disrespectful towards him. Secondly, the planet isn’t attractive anymore due to the abuse by humans. When he arrives, he tries to talk to someone important, but he gets Nathan. Nathan’s superiors believe that ShZ is a crazy human, in costume, so they think it is funny to give ShZ to Nathan to handle. Nathan believes ShZ is a coworker in disguise and that this whole thing is a joke, and laughs hysterically. He gets a reality check when ShZ starts flying. Then he realizes the rumors are true. Fortunately, nature will solve this problem. I totally enjoyed "Earth Inherited," I just wish it was full size instead of a novelette. I wasn’t ready for it to end! The author’s sense of humor runs wild throughout this story. She does a great job of creating quirky characters. The writing is superb, totally engrossing! I enjoyed being able to see the alien’s perspective of earthlings. Through his eyes, we aren’t too impressive! However, he is also a hypocrite for judging us, as he is responsible for almost wiping out the population on his planet because of his greedy addiction. I have never seen issues like this addressed in my alien sci-fi adventures, so I think it is fun to be able to focus on the failings of both the humans and the aliens. There are other entertaining characters in this story, including two newscasters who also have fun roles in this story. For a great escape, “Earth Inherited” by Justine Avery is a must read!